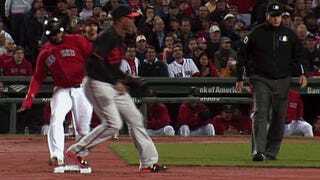 Ubaldo Jiménez left tonight’s game against the Red Sox without surrendering a base hit after umpire Jordan Baker ejected the Orioles pitcher for allegedly hitting Boston third baseman Pablo Sandoval with a pitch on purpose in the fourth inning. The pitch would have been in retaliation for Sandoval’s dirty slide aimed at Baltimore second baseman Jonathan Schoop’s unprotected pivot leg. Even NESN’s announcing team acknowledged the slide was a bit less than kosher and that the ejection came awfully fast; pitchers are generally issued a warning in similar circumstances before a straight ejection. Of course, this is also Ubaldo Jiménez we’re talking about; he’s no stranger to letting pitches get away from him.